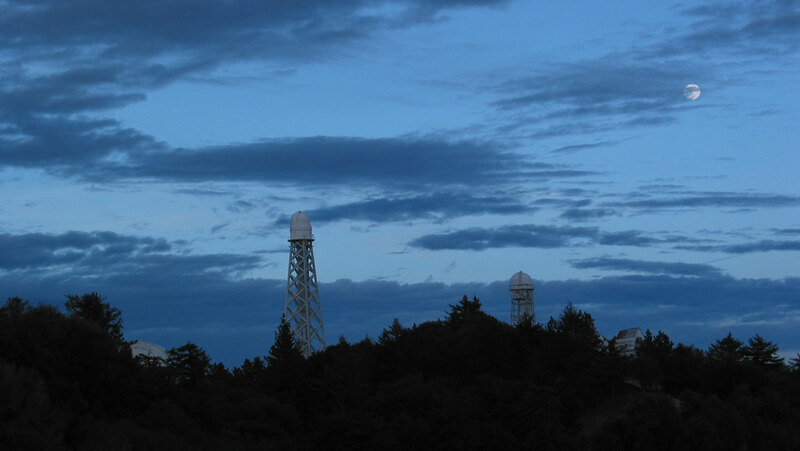 This dusk view looking northeast from the Pavilion parking lot area shows a small portion of the 100 inch dome and the three historic solar telescopes atop the frontal ridge on Mount Wilson. 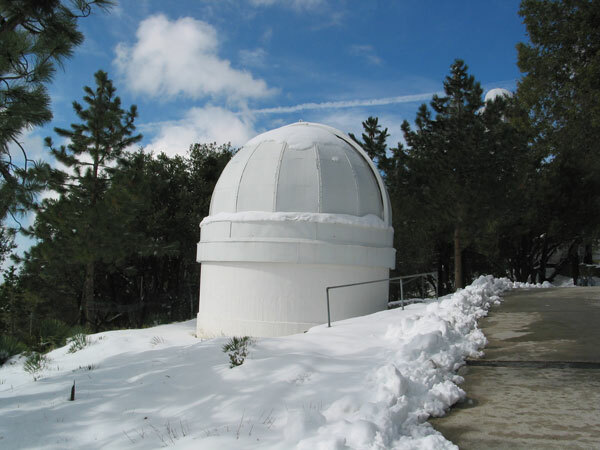 From left to right are the 100 inch dome, 150 foot solar tower, 60 foot solar tower and the structure housing a portion of the Snow horizontal solar telescope. This is one of the oldest domes on Mount Wilson, dating back to the 1910's. The split shell dome originally housed a 6" Brashears refractor on a Warner & Swasey equatorial mount that was used to entertain guests at the Observatory during the time of George Ellery Hale. 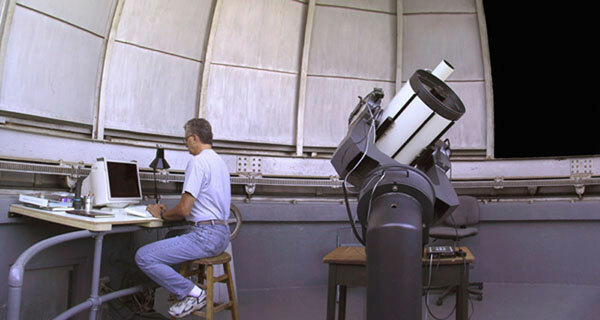 The refractor and mount have been gone from the dome since 1990, carefully packed and stored away for its eventual return to the dome, which is scheduled to occur in 2005. In the background to the right of the 16" dome is the 60 foot solar tower, constructed in 1908 and used by George Ellery Hale to identify magnetic fields in sunspots by observing the Zeeman effect on spectral lines. Operated now by USC, the telescope is used to probe the interior workings of the sun as part of the High Degree Helioseismology Network. Here's a photo of me in the 16 inch dome. 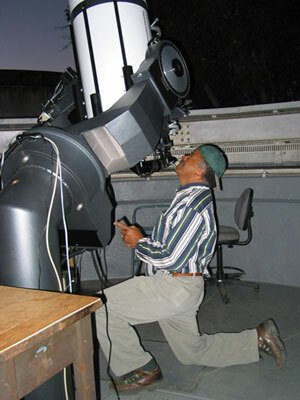 The Meade 16 LX200 telescope is controlled using a desktop computer running TheSky software. Co-leaders of operator training for the 16" program. Tom and Darrel have unselfishly volunteered many hours of their time to the Mount Wilson 16" program. 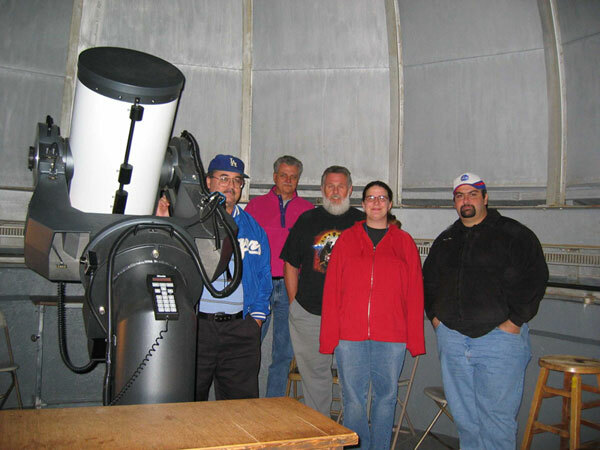 They have both contributed significantly to the success of the annual CUREA (Consortium for Undergraduate Research and Education in Astronomy) program held at the Observatory, facilitating the planned nightly spectroscopic and photometric activities. 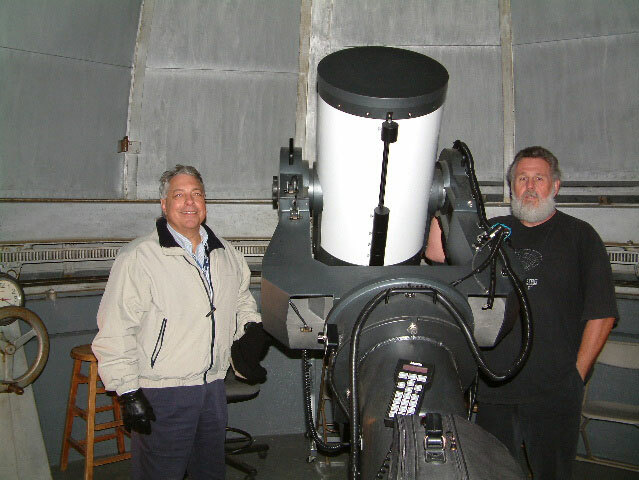 In addition to their involvement in the 16" program, they are both certified operators on the venerable and historic Mount Wilson 60" reflecting telescope. It is volunteers like these that make Mount Wilson such a special place. that Matt, Nora and Arbi passed their testing and became certified operators in the 16" program. 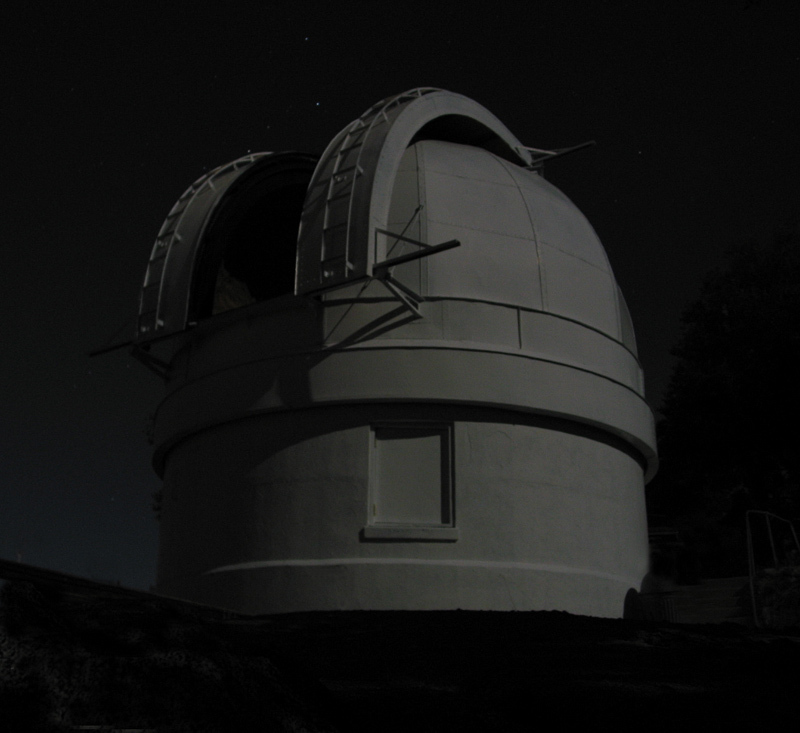 Barnard, working and singing through the night from this airy perch while imaging the splendors of the Milky Way. Using the 10"
called Mount Wilson home for nine months while collecting the images that today comprise his most venerable and highly prized work. is a truly humbling experience. 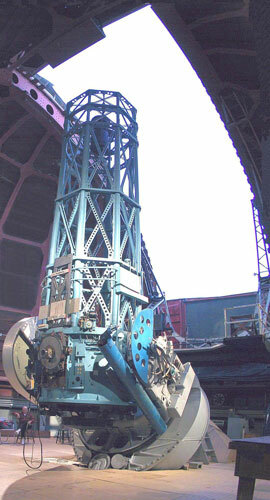 The Mount Wilson 60" reflector was commissioned in 1908, surpassing the 40" Yerkes refractor and becoming the largest telescope in the world at that time. located our place within the Milky Way galaxy, relegating us to a position of relative unimportance part way out on one spiral arm of our island universe. Used primarily nowadays for visual observing in its f/16 Bent Cassegrain configuration, this finely made instrument offers incredible views of the heavens. 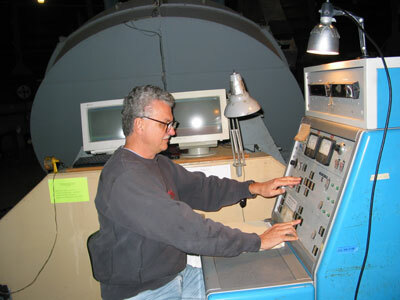 I'm lucky to be an operator on the 60" telescope and have the chance to observe with this wonderful machine. Views of the planets, moon, double stars and deep sky objects such as planetary and diffuse nebulae are breathtaking when seen through this telescope. Observing distinct, individual globular clusters in M31 and M33, resolving fine detail in Jupiter's cloud bands, or seeing the ultra-fine structure of planetary nebulae is all possible and relatively easy on nights of good seeing. Much of the technology in the dome is 1907 vintage, however the control console pictured at left is a 1950's vintage upgrade. It's basically a digital setting circle scheme, with the operator matching RA and Dec coordinates of a known object with the encoder display on the adjacent CRT monitor. 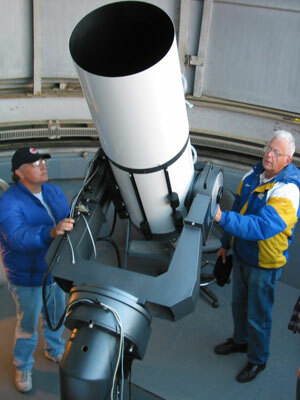 Plans are currently underway to fully upgrade this scope with modern drive motors and a computer Go-To control system.